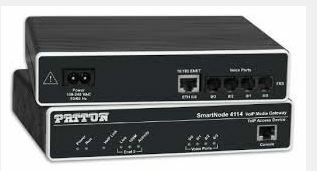 The Patton SmartNode SN4114 VoIP gateway comes in three models, or SKU’s. One model has both FXS and FXO ports, another has four FXO ports, and the third has four FXS ports. With FXS ports the SN4114 connects to any legacy telephone or PBX and provides dial-tone, ringing, caller-ID and other services. With FXO ports, the local PSTN can be accessed enabling local calling and enhanced toll-bypass applications while using a single connected telephone. Patton’s SN4114 VoIP Gateways are often used with 3CX Phone Systems; a guide for configuring these can be found on the 3CX site.